After Thanksgiving, once our turkey is picked to the bone and we’ve tossed its frame into the pot for broth, we make Turkey and Wild Rice Soup. Fragrant, herbaceous thyme blends perfumes the house as it simmers in a savory, golden-rich turkey broth dotted by carrots, celery and onions. Like most good soups, it’s not a complicated recipe; rather, it’s simple and in its simplicity is an amazing, rich and heady flavor. To make turkey and wild rice soup, you’ll begin first by picking your roasted turkey clean, and chopping the meat into bite-sized pieces. Once that turkey frame is picked clean, you’ll need to simmer it in water and wine to make the broth that forms the foundation of this soup. You’ll also want to precook the wild rice which keeps it nice and fluffy, and prevents it from absorbing all your broth and making what should be a light soup into a thickened porridge. Once you have your ingredients at the ready, you’ll start by sweating the onions, carrots, and celery together with olive oil and salt. Unlike sautéing, in which the vegetables are cooked hotter and allowed to brown, sweating gives these vegetables a softer, sweeter flavor and encourages them to release their liquid and steam. Once the onions are translucent, but the carrots still firm, you’ll add the broth, roasted turkey meat and cooked wild rice along with several sprigs of thyme. This way, you need only wait until the carrots are cooked through to serve the soup, as the wild rice and turkey have already completed their turn cooking and need only to warm a bit in the hot broth. The fragrant tiny thyme leaves will fall away from their tough stems as the soup simmers, and you need only pluck out the stems just before you serve the soup. Like all whole foods, there’s something resonantly wholesome and deeply nourishing about Turkey and Wild Rice Soup. 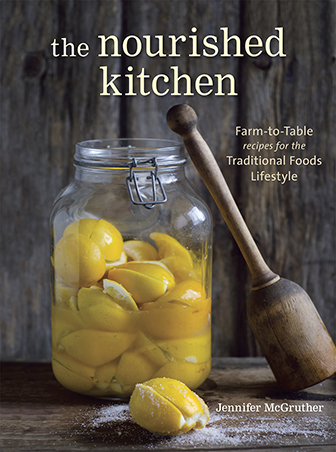 It’s real food at its best: not only rich with vital nutrients, but also a recipe born of old-school economy where nothing goes to waste. Turkey is particularly rich in the amino acid tryptophan which performs several functions in the body, including boosting serotonin; for this reason, tryptophan-rich foods are thought to help improve quality of sleep, improve pain tolerance, and increase emotional well-being. Wild rice is not only rich in dietary fiber that helps nourish beneficial microbes in the gut, it is also a very good source of zinc, which is essential for immune system function and reproductive health in both men and women. In addition to zinc, it is a good source of other minerals including phosphorus and magnesium. Thyme is a member of the mint family, and it’s vibrant, herbaceous flavor adds a wonderful perfume to many savory dishes. 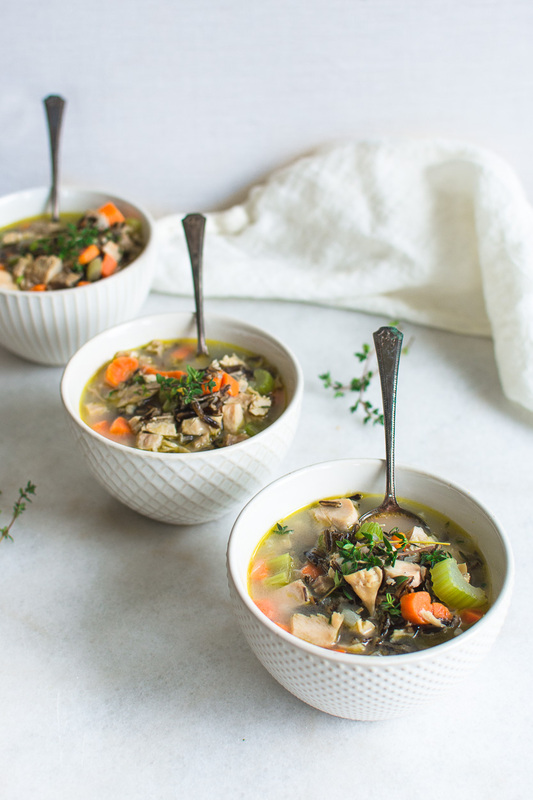 It pairs particularly well with poultry which makes it a good match for this Turkey and Wild Rice Soup. In traditional herbal medicine, thyme was used to help soothe coughs and colds, owing to its aromatic components. Some research shows that the essential oils in thyme may also help to uplift mood. 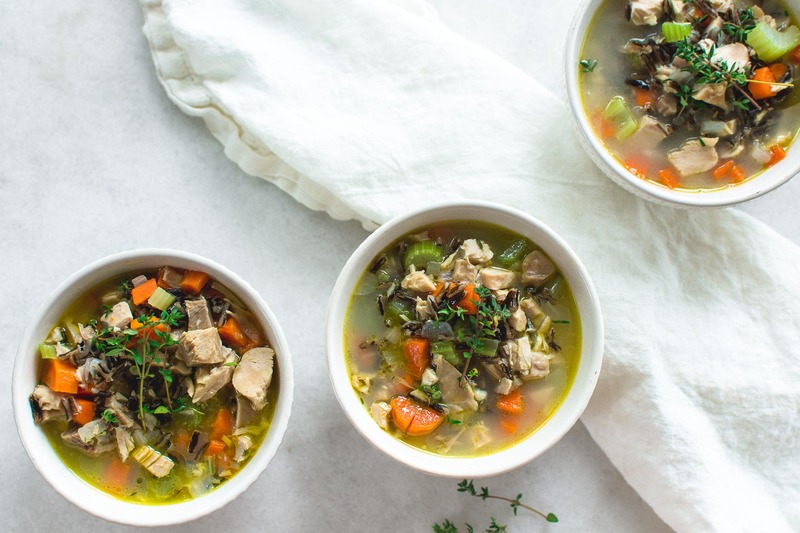 Fragrant with fresh thyme, this Turkey and Wild Rice Soup is positively brimming with fresh vegetables, nourishing turkey bone broth and plenty of wild rice for a wholesome way to use up Thanksgiving leftovers. Warm the olive oil in an enameled cast iron skillet over medium heat. Toss in the onion, celery and carrots, and sprinkle the salt over them. Stir to coat the vegetables in olive oil, and cover the pot with a lid. Turn down the heat to medium-low and allow the vegetables to sweat for five to six minutes, or until the onions turn translucent. Uncover the pot, and stir in the chopped turkey and the wild rice. Drop the fresh thyme into the pot at simmer for twenty to thirty minutes or until the vegetables are tender. Using tongs, pluck out any tough stems of thyme, and discard them. Adjust the soup's seasoning, and serve hot. This soup will keep in the fridge about five days or frozen up to six months. How to Cook Wild Rice in the Instant Pot. This recipe calls for cooked wild rice. Precooking the wild rice reduces the amount of bone broth you must use and reduces the cooking time of the soup. I recommend cooking the wild rice in an Instant Pot, by placing 1 cup wild rice in the pressure cooker's insert, pouring in enough water to cover it by 2 inches and cooking under pressure for 15 minutes before draining. Soup can only be as good as its broth, and a good broth – rich with deep savory notes is essential in making Turkey and Wild Rice Soup. Fortunately for you, if you roasted a turkey that is, you can make the best broth at home with ingredients you already have on hand. 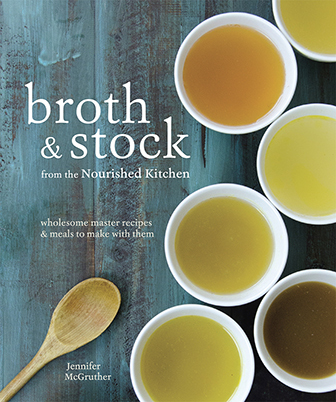 You can also purchase turkey bone broth at many health food stores, too, but it’s lackluster in comparison to what you can make at home. So after you’ve stripped your roast turkey to the bone, simply simmer its frame and scraps in a pot of water with a splash of wine as in this recipe for Turkey Bone Broth. There’s a few things that partner particularly well with this soup, especially to round it out and give you a full meal. Salads are always nice partners for soup, as are breads and rolls. An Autumn Salad partners well with this soup, especially for a light lunch or dinner. Maple Einkorn Dinner Rolls are perfect for sopping up the extra broth. And Pumpkin Custard with the lightest touch of whipped cream is nice served after this soup, as a dessert.